U.S. President Donald Trump has called on Russia to remove its troops from Venezuela. A Russian Il-62 passenger jet and an An-124 military cargo plane carrying troops and equipment arrived at the international airport outside Caracas on March 23. U.S. President Donald Trump meets with Fabiana Rosales, wife of Venezuelan interim President Juan Guaido, in the Oval Office at the White House on March 27. The U.S. government indicated it believes the Russian troops include special forces and cybersecurity experts. Russian Foreign Ministry spokeswoman Maria Zakharova said at a televised press briefing on March 28 that Moscow “is not threatening anyone,” and its increased military presence in Venezuela does not change the balance of forces there. The military personnel were sent as part of Russia’s agreements to supply weapons to Venezuela and will stay “as long as needed,” she said. Venezuela’s military attache in Moscow, Jose Rafael Torrealba Perez, said on March 28 that the Russians will not take part in military operations. He also said that Venezuelan Defense Minister Vladimir Padrino Lopez is expected to visit Moscow next month as part of the cooperation between the two countries. Russia has made billions off investments in Venezuela and continues to back the dictator, Nicolas Maduro, whose policies steered the nation into an economic and humanitarian disaster. The United States and more than 50 other countries have recognized Juan Guaido as Venezuela’s interim president. 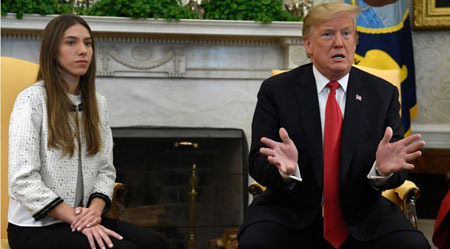 Trump on March 27 met with Guaido’s wife, Fabiana Rosales, at the White House.